Had a trip out to New Brighton this afternoon, some lunch on the sea front and then on to pick up an ebay camera purchase. This had been listed previously and hadn’t sold, it was then relisted at the same price so I thought I’d contact the seller to see if he was flexible on the price. Fortunately he wasn’t offended by the price I offered. 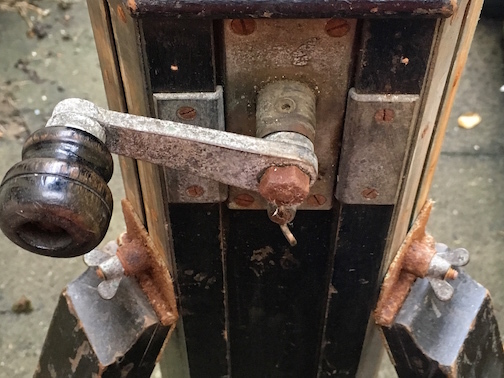 Tripod made by Houghton Butcher, you can just make it out on the label, it has some severe corrosion but nothing is broken and its all solid, so it should scrub up with some work. This is the hand cranked version. 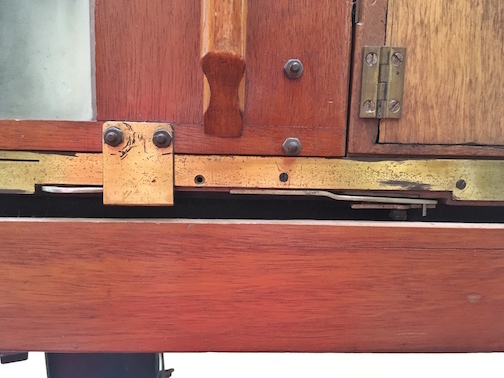 Roller blind shutter by Thornton Pickard seems to be in working condition. 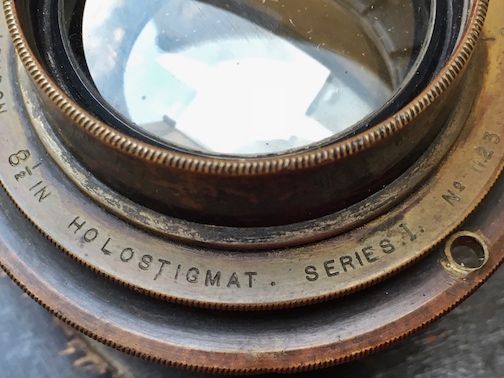 The lens by Watson and Sons, is labelled Holostigmat Series 1, which I think is 1901. Its 8.5 inch focal length with an unusual f6.1 aperture. All blades clean and open smoothly. The seller had suggested the threads had been crossed so it had been kept in place with tape. It was actually just pushed into the incorrect flange that happened to be on the shutter. The lens has its own integrated flange. Behind the shutter on the lens board I can see where the lens was originally mounted. 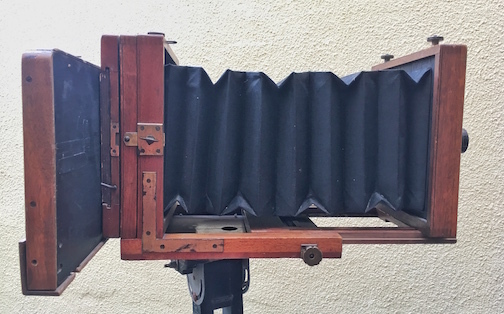 There are no makers mark or labels when it comes to the camera itself. 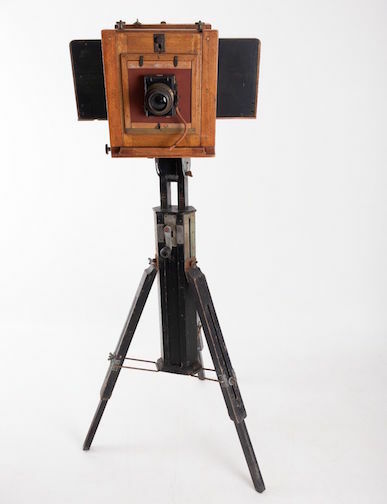 It does have some similarities to the Watson or Marion studio cameras. 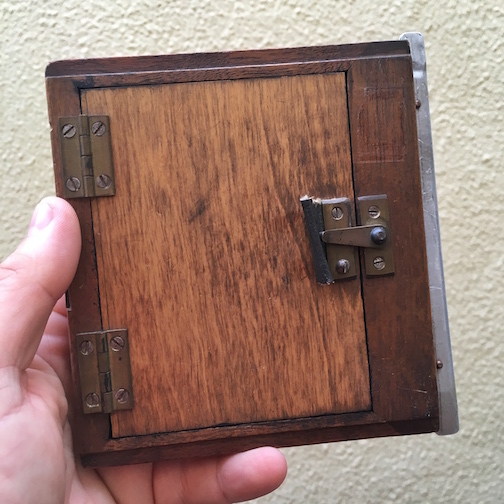 This one is half plate format but what is unusual is the rotating sliding back for quarter plate that has been bolted on. 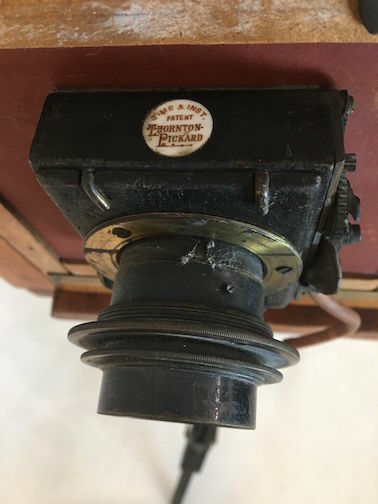 Whenever I see a rotating back I always think of Billcliff cameras. In horizontal but portrait mode. It has some clever apparatus to pull the darkslide automatically when you move the holder to the left. When pushed to the right it closes and the small plate holder can be removed by releasing the brass arm. There are additional locking arms. In vertical but landscape mode. 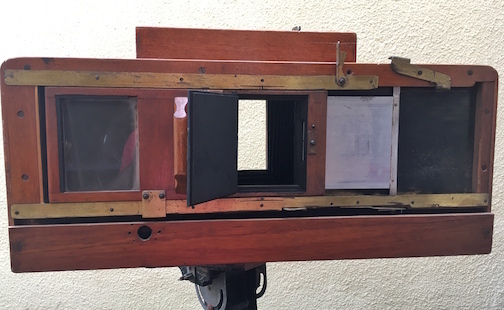 This might need some tweaking as the whole back slides downwards in the original half plate slot on the main camera body, so there must be something loose or not tightly bolted. Not exactly sure what these brass movements are for. 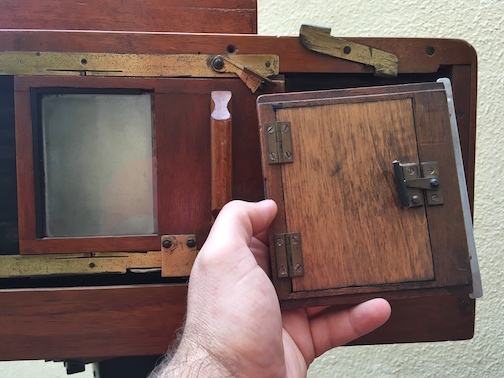 They move when the plate holder/ground glass apparatus is moved to the left but I cannot tell what they actually do. 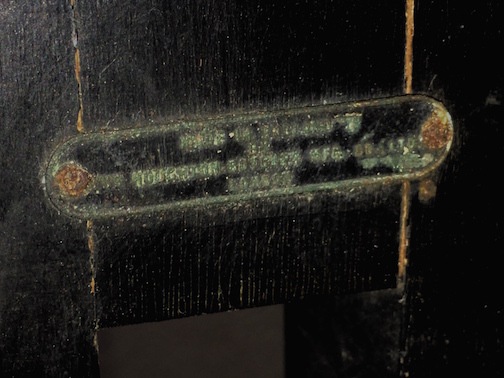 The long section of timber along the bottom has some movement and is missing a screw. I’m not sure what the purpose of this section is. 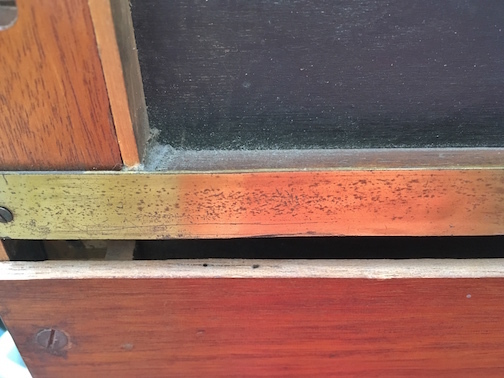 Is it just protecting the brass work I mentioned earlier? I’ll take it apart for a closer look. The plate holder is quite basic but does its job. The silver strip of the darkslide catches a section of the brasswork and auto pulls out as you slide it all to the left. And then closes when you return to the right. Pretty clever. 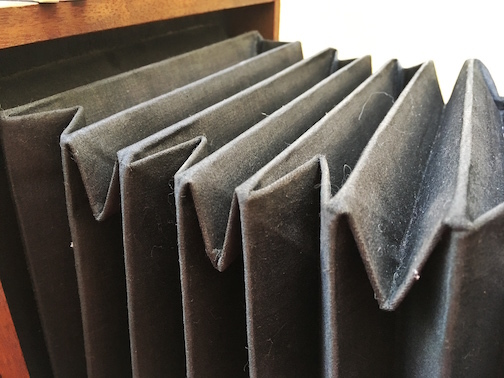 Bellows are in really good condition, and are of the heavier canvas square corner type. and they extend quite a way. 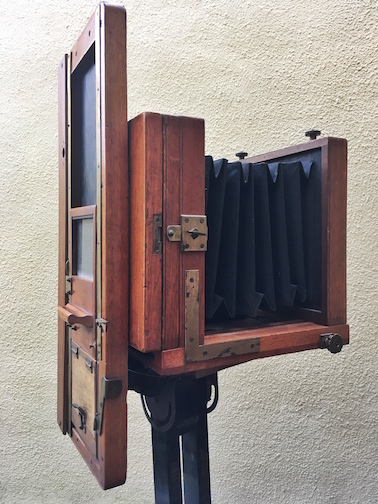 So quite an interesting camera for the studio, the tripod is really heavy, the whole kit will be a novelty for workshops at the very least. If anyone has further info on this particular sliding back then please do get in touch. 11 Jun This entry was written by Fourtoes, posted on June 11, 2018 at 7:30 AM, filed under Misc..